Please provide specific information about the hotkey(s) you set. 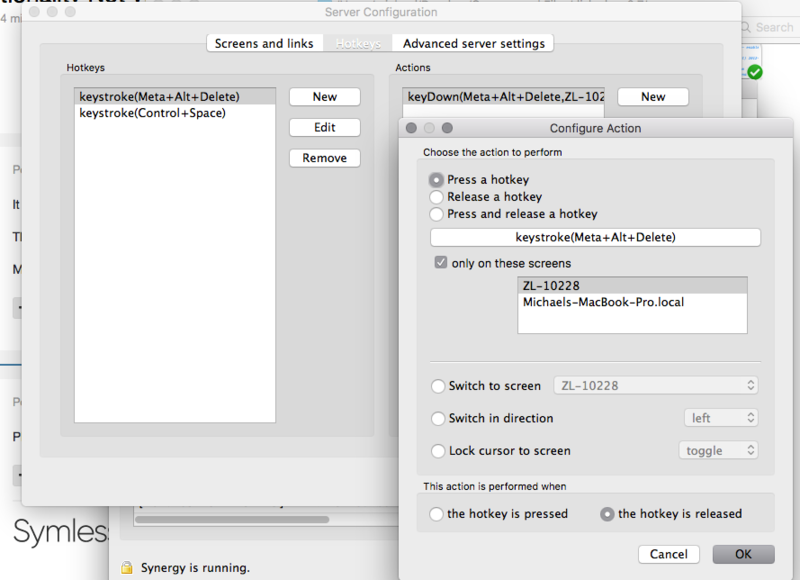 A quick example is that I want to send a Ctrl-Alt-Del from mac server to trigger on my PC. Everytime I attempt to do so, nothing happens. Please provide more details for both machines (OS version, 32/64bit, Synergy version installed, client/server). Apologies for the delay, I have been swamped. Anyhow, server is MacOS Sierra 10.12.3 running Synergy 1.8.6 RC1-f4d9faa (currently, was running the latest version from the site) as it was the last known version that had working hotkey functionality. Client PC is running Windows 7, up to date on all patches. Synergy version is the same as what's running on Mac. Everything is 64-bit. Can you try to do a CTRL+ALT+Pause/Break instead of the CTRL+ALT+DEL? I'm using a Mac keyboard, so there isn't a Pause/Break. Regardless, I don't know if that's a solution as Ctrl-Alt-Del on a Mac doesn't do anything system wide, so it shouldn't be an issue to use as a hotkey combo.